This is the Constructo 1/65th Scale Model Mayflower Sailing Ship. This Static Display Boat is Recommended for Advanced Modelers. This is the Constructo 1/65th Scale Model Mayflower Sailing Ship. This Static Display Boat is Recommended for Advanced Modelers. This ship is famous for sailing from Southampton in 1620 with 102 pilgrims on board and landing at Plymouth Rock in Massachusetts. Brass parts such as the chain plates, lantern braces, eyebolts, and wire for handbolts.. Cast iron anchor and bailing pumps. Beige cotton cloth with patterns for all sails. Fabric flags for each mast. All wood construction features Bokapy, Mansonia, Ramin, Mukaly, Samba and plywood. Wooden stand trimmed with Ramin and Bokapy woods. 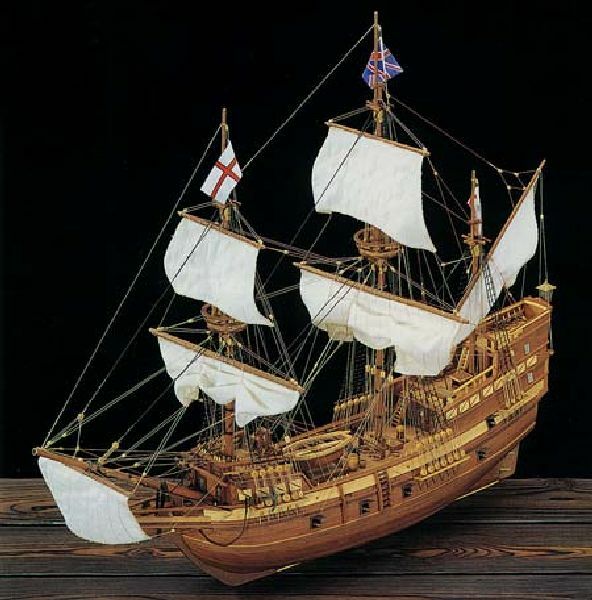 One Constructo 1/65th Scale Mayflower Sailing Ship. All fittings, wood, cloth for sails, thread for rigging, display stand and flags, plan sheets, sail panels and full-color instruction manual.